You start building the elevators by cutting the stiffeners. Do this just like you did for the rudder. 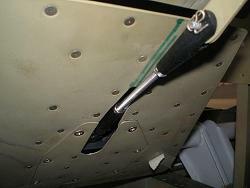 Don’t forget to install the platenuts on the E-615PP before you rivet it to the skin. You can install them later, but it is a lot easier to do it before. 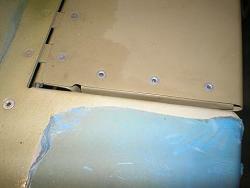 Again, I backriveted all the stiffeners and the E-615PP to the skins, giving me a smooth finish. 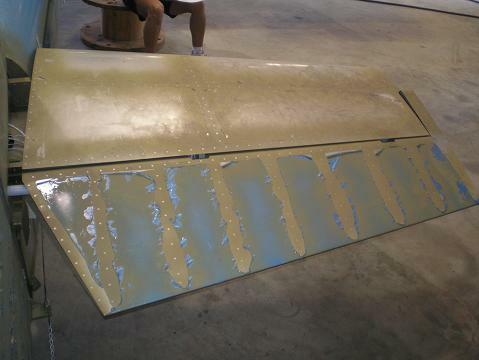 Finish preparing the skin by bending the trailing edge until the skin matches up snug to the E-702 spar. 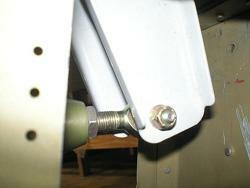 As you rivet the skeleton and the skin, make sure you clamp the parts tight to the bench. You can squeeze all the rivets to attach the skin to the skeleton, removing the need to clamp the assembly. 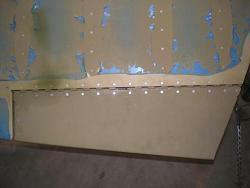 Before you rivet the left skeleton together, drill the required holes for the trim system you are installing. 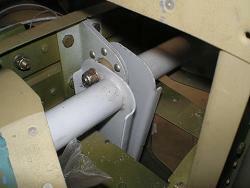 After the skeleton is riveted, install bushings before riveting the skin. I have electric trim, so I only had to worry about routing the wires for the trim servo. I enlarged the hole that the mechanical trim cable would feed through, and installed a bushing on it. My wires run through the stab, and into this hole. 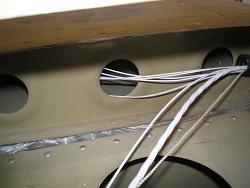 The trim tab really isn’t that hard to make. Spend the time to make the blocks the right size and shape before trying to bend—a little more time spent here is well worth the result. When bending, go slow. Work your way back and forth across the tab. Don’t try to bend one end of the tab all the way down before starting on the other side. As an alternative, you can use another block of wood across the entire side tab. Then hit this piece of wood with the hammer. This will apply the bending force evenly across the tab. Bend the leading edges and you are almost finished. The last thing to do is match them up to the horizontal stab, and drill the holes in the horns. You need to do this one elevator at a time. Don’t hang them both just yet. Start by hanging the right one according to the plans. Once everything is aligned, you will be able to drill the horn from the left side of the HS-411PP hinge bracket/bearing assembly. This gets you a good pilot hole that still needs to be enlarged to final size. 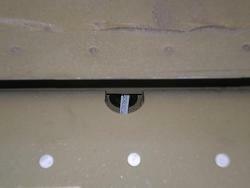 It is very easy to move the center of the hole in the process. The best way to ensure it doesn’t move is with a drill press. This is a little tricky, since you have to clamp the entire elevator onto the drill press. It may mean raising the drill press enough to allow the whole thing to hang down without hitting the floor. Once everything is centered and clamped, you can swap out the drill bits for larger sizes without worrying that the hole will move. © Copyright Kit-Plane-Advice.com. All rights reserved.